Barstow, Anne Llewellyn. Witchcraze: A New History of the European Witch Hunts. San Francisco: Pandora/Harper Collins, 1994. Herzig, Tamar. "Witches, Saints and Heretics: Heinrich Kramer's Ties with Italian Women Mystics." Magic, Ritual and Witchcraft, vol. 1, no. 1 (Summer 2006): pp. 24-55. Lea, Henry Charles. Materials Toward a History of Witchcraft. Philadelphia: University of Pennsylvania, 1939. Summers, Montague, ed. The Malleus Maleficarum of Heinrich Kramer and James Sprenger. 1928. Reprint, New York: Dover Publications, 1971. Trevor-Roper, H. R. The European Witch-Craze. New York: Harper & Row, 1957.
mandrake A poisonous perennial herb that grows in the Mediterranean region and that is reputed to have powerful magical properties. Mandrake, part of the nightshade family, has a strong and unpleasant odor. It is highly toxic, though it is used in therapeutic remedies and as an aphrodisiac in love PHILTRES. The magic attributed to mandrake is due to the shape of its thick root, which looks like a man or woman, or sometimes a phallus, and to the phosphorescent glow of its berries in the light dawn. In folklore, a mandragoras, a demon spirit resembling a little man with no beard, dwelled in the plant. According to lore, mandrake shrinks at the approach of a person. Touching it can be fatal. If uprooted, it shrieks and sweats BLOOD, and whoever pulls it out dies in agony. It is safely harvested by digging around all but a small portion of the root, tying a dog to it and leaving. The dog strangles itself pulling out the root in an attempt to follow its master. The death of the dog gives the mandrake root the power to protect against DEMONS. 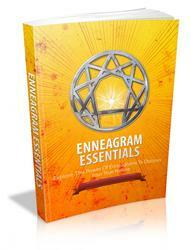 The root also is believed to prophesy the future by shaking its head in answer to questions. In ancient Greece, mandrake was called the plant of CIRCE, the witch goddess who made a juice of the root and used it to transform Odysseus' men into swine. In Greece and Rome it was used medicinally as an anesthetic before cauterization and surgery. Medieval witches were said to harvest the root at night beneath gallows trees—trees where unrepentant criminals, evil since birth, were supposed to have died. The root purportedly sprang up from the criminal's body drippings. According to Christian lore, the witch washed the root in wine and wrapped it in silk and velvet. She fed it with sacramental wafers stolen from a church during communion, which placed witches in the DEVIL's camp. Mandrake is reputed to be an aphrodisiac and a fertility pill and is known as love apples. In Genesis, the barren Rachel, wife of Jacob, ate mandrake root in order to conceive Joseph. 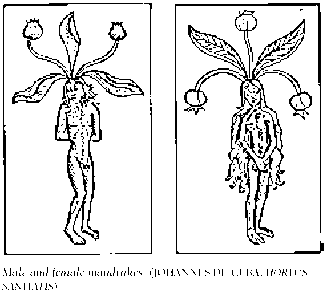 Mandrake is given to women to ensure large families of boys; Arab men wear the root as an amulet to enhance virility.